Imagine a sultry, hot, sweaty Shanghai summer day. Like today. Thirty degrees and 98% humidity. You're sweating without even moving, and when you do move, it ain't pretty. Looking for relief from the heat, you sit down at a hole-in-the-wall restaurant and order. 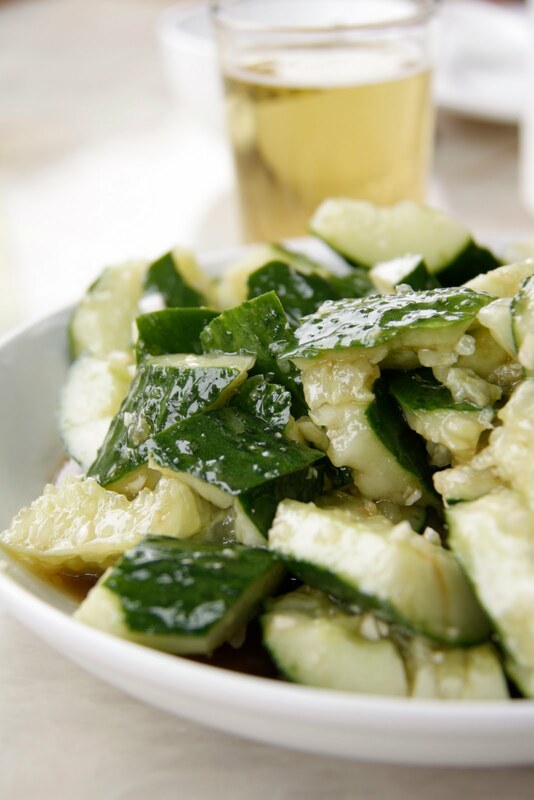 The waitress brings you a long, tall chilled bottle of Tsing Tao beer, already frosted on the outside from the sudden temperature change from the refrigerator to your table; and a dish of cold cucumber. Cucumber??! What the....??? Cucumber was never my favourite vegetable, at least it wasn't until I came to China. In Australia, cucumber has garnish status only, and there are no cucumber-only dishes on any menu at any restaurant I've ever eaten at. The Chinese though, have a summer love affair with cucumber. It features on the menus of practically every cuisine across China. Why have I never eaten it like this until now? Broken or cut into chunks, doused with garlic, oil and salt, or sliced into thick rounds and dressed with a mixture of dark vinegar, sesame oil, garlic and chili - divine. Those combinations just make the cold, crunchy cucumber sing. On a hot day, this is the best accompaniment to a cold beer you can imagine.